Please help me find my lost dog named "Kid". We are from Chicago visiting relatives in Evergreen when Kid wandered away from the house last Sunday afternoon. Missing from Little Big Horn Dr. and 73. There have been sightings all over the area, especially around Blue Creek rd. A woman almost had him on Christmas Eve at 11:30 at NIGHT on Brook Forest rd. near Cub Creek Park. She spent 10 minutes trying to coax him over but every time she took a step towards him he ran away. So he is very scared. Please help me locate this guy! I can't leave him here but I can't stay forever. If you have seen Kid please call Steve at 312 608 2626. * Grayish / and Black coat, with black ears and black patch over one eye. Have you found your dog? Hugs. We will keep helping by posting on our social media. I hope you find him soon! We will get the word out. Hope that he is found soon. Do you have a picture we could post for you? EVERGREEN - Nine bitterly cold days and nights without his best friend. 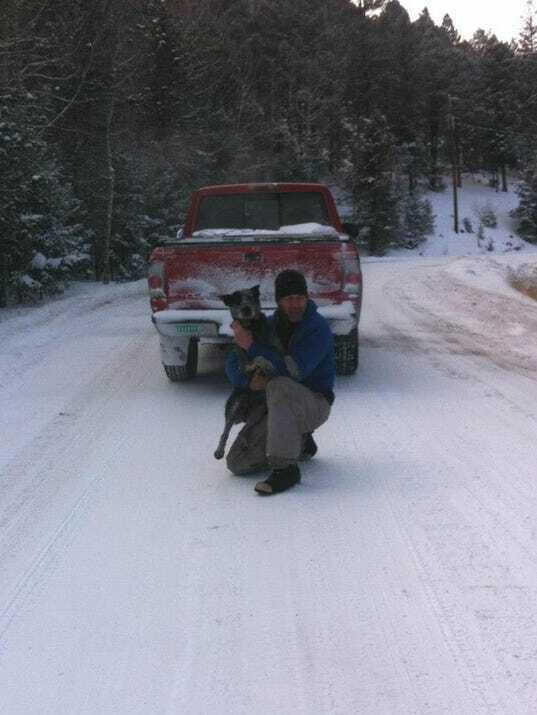 A blue-heeler named Kid escaped during a family visit to Evergreen - the dog and his owner, Steve Gilligan, are from Chicago and were in Colorado for Christmas. Kid escaped from the family home on Dec.